Paradise Taurito Valle Aquapark Hotel Free Child Places Low Deposit Family Holidays @ Web2travel Deals. Online Since 2000. Finding the Best Value All Inclusive Holidays to Playa Taurito, Gran Canaria from UK airports. 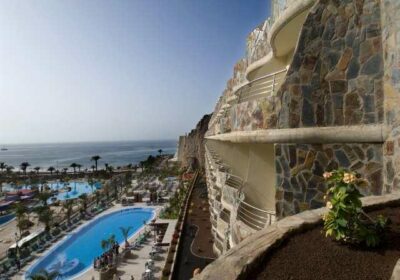 The 4 star all inclusive Paradise Taurito Valle & Aquapark hotel, Taurito, Gran Canaria has a great selection of amenities, making this an ideal choice for all the family. Restaurants can be found nearby to the complex, as well as the beach with scuba-diving, water-skiing and jet ski hire. Also called Paradise Valle Taurito by some Tour Operators. Reviews by guests generally give a rating of Excellent or Very Good. Free Child Places are subject to availability. Located just 70m from the beach and 5 minutes to the resort centre. The hotel is situated 4 km from Puerto de Mogan and 100m from the bus stop. A golf course can be found 4 km away. Deals from Multiple Travel Companies for all Costa Taurito, Gran Canaria Holidays. The Paradise Taurito Valle & Aquapark Hotel offers guests a heated swimming pool. Comparison: The Paradise Taurito Valle & Aquapark Hotel is different from other accommodation in Taurito because. The central location of the Paradise Taurito Valle Aquapark Hotel means that everything is on your doorstep and you can walk to shops, bars and the beach. Good: Rooms are very large with a large balcony. Food is quite good quality. Friendly staff. Good range of facilities including restaurants, shop, mini market, children play ground, pool towels, baby corner in the restaurant and baby sitting (upon request). The spa and wellness area with gym, indoor heated pool, beauty parlor, massage rooms, sauna, steam bath, gymnasium, fitness and cardio fitness. Good sized accomodation. The suites comprise of a living room, bedroom and two bathrooms (one with shower and one with bath) and the double rooms comprise of bathroom with shower or bath. Close to good beach (5 mins on bus) at playa mogan. Beach at Taurito is black sand and quite small. Bad: Air conditioning may not always be available. Not really anything bad to say about this property. Ideal for: The Paradise Taurito Valle & Aquapark Hotel is ideal for Families with Small Children or Couples (outhwith school holiday periods) who want a really nice, peaceful place to stay. Taurito is low key, beach resort and not really a place for people looking for a lively holiday. Overall the Paradise Taurito Valle & Aquapark Hotel offers an excellent value for money holiday location. Booking: You can book the the Paradise Taurito Valle & Aquapark Hotel with many companies. All rooms have balcony with chairs, table and one sun lounger, side view to the sea, bathroom with bath tub or shower, hair dryer, magnification mirror, air conditioning, telephone, satellite television with video channel, mini bar and safe deposit box (local charge). The suites comprise of a living room, bedroom and two bathrooms (one with shower and one with bathtub) and the double rooms comprise of bathroom with shower or bathtub. The facilities and services within the complex include five floors, 24 hour reception hall located in the basement, outside pool with sun deck, sun loungers and umbrellas, upper hall between the restaurants, with info corner and Internet, two lifts, luggage room, shop, mini market, car parking, stage for activities, laundry service, children play ground, pool towels, baby corner in the restaurant and baby sitting (upon request). The spa and wellness area offers gym and fitness, indoor pool, beauty parlor, massage rooms, sauna, steam bath, gymnasium, fitness and cardio fitness. Sports and leisure consist of aerobic, billiards, boccia, table- tennis, volleyball, water gymnastics, mini golf and jogging. Also available are kid’s play ground and fun fair, mini golf course, jogging area, multipurpose court with artificial green and theme water park Lago Oasis. Taurito Beach is practically on the doorstep. This is home to one of Gran Canaria’s great waterparks, which it shares with the neighbouring Paradise Lago Taurito. It comes with loads of white-knuckle slides, plus plenty for smaller slides, too. The hotel has its own pool, a smart buffet restaurant and huge, contemporary bedrooms. All of the pools here use saltwater and some of the slides have height restrictions. The larger slides have a minimum height restriction of 120 cm and the Pirate Ship and mini-slides have a minimum height restriction of 100 cm. Paradise Taurito Valle Aquapark Hotel was previously known as LTI Paradise Taurito Valle & Aquapark Hotel and is called Paradise Valle Taurito by some Tour Operators.